IND Architects have designed the new offices of global payment solutions company BPC Banking Technologies located in Utrecht, Netherlands. 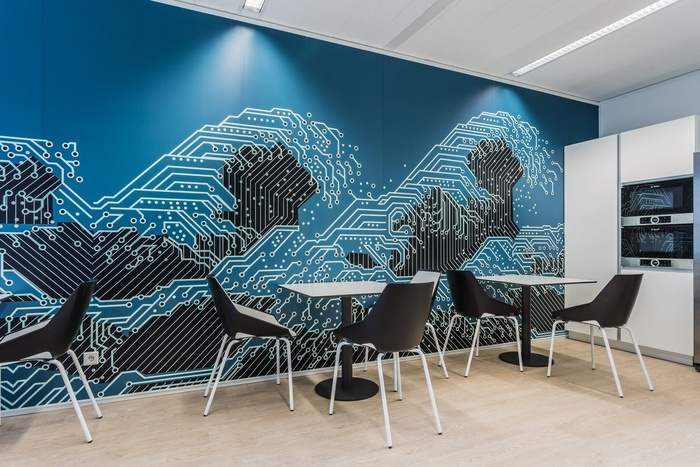 The office of the company BPC Banking Technology located in the Dutch city Utrecht is realized in a modern Scandinavian style. The company is engaged in implementation of projects in the field of technological infrastructure of retail businesses for financial institutions and industrial corporations, therefore its interior has combined visual expression and brightness appropriate to the area of IT technologies development, and austere lines and colors typical for financial sector. Design of the reception desk is driven by the company’s corporate style—pointed corners and blue color reflect its logo. Visitors can wait for their appointments in a comfortable area with cushioned furniture and coffee tables. In the waiting area the company’s name is printed on the wall as a 3D graphics—triangles, squares and other geometric figures are still put together as the name BPC here but scatter to pieces afterwards.